Time Displacement – Chemobrionic Garden explores a relationship between hydrothermal chemistry, the passage of time, and the evolution of sound. 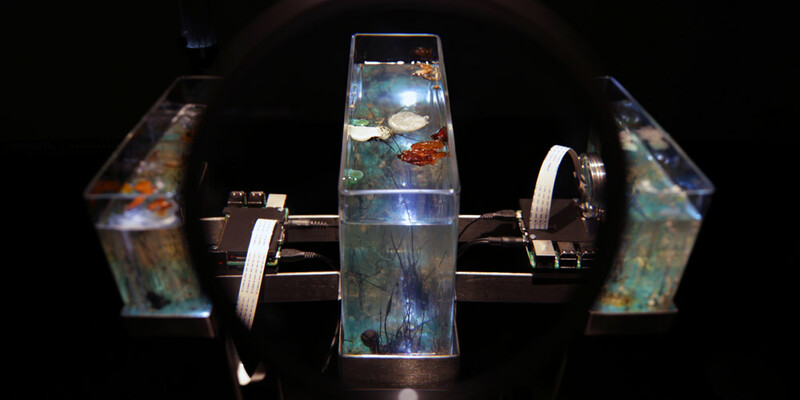 The project consists of several small chemical garden formations in a water glass (sodium metasilicate) solution, to provide an insight into research on the origin of life and on chemical processes. The chemical reactions are monitored by cameras to detect changes in color and in shape by means of microcontrollers. The changes affect the code for live sound generation, and slowly alter the generative drone composition pervading the gallery space. The project’s theoretical background is based on a paper entitled “From chemical gardens to chemobrionics”, written and issued by a group of 21 scientists on 29 May 2015, a reiterating call for research into the principles of self-assembling structures, to produce as they suggest new insights into the origin of metabolism in Earth’s early geological periods.